The Bathtub Transfer Bench is a safe and comfortable option for transferring. This transfer bench features space for shower curtain placement, an adjustable seat height, and a textured, non-slip surface on both the seat and back. Comes standard with oversized slip-resistant tips for increased stability. 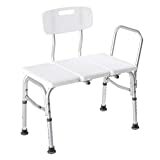 NON-SLIP & STURDY PLASTIC BENCH: This bathtub transfer bench is made from sturdy plastic with a non-slip seat, so you can easily & conveniently transfer into & out of your tub even when the tub transfer seat is wet. This bench can support up to 300 lbs. SAFELY SHOWER & BATHE: This bathtub transfer bench helps you safely & comfortably get into your bathtub. 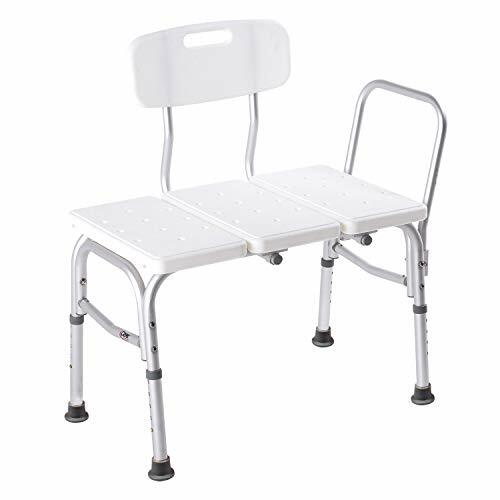 The reversible seat back allows for right or left hand entry into your tub: simply sit down on the bench & swing your legs over the side of the bath. TRUSTED SUPPORT: Compare the trusted support of Carex home care products to products from Vaunn, Drive Medical, MedMobile, Dr Kay's, Dr. Maya, Medline, BalanceFrom, Medokare, NOVA Medical Products, Healthline Trading, Vive, TMS or Duro-Med.